Description $2,000 PRIZE FUND Guaranteed. 3 Sections. PREMIERE Section - Must be USCF-rated 1800 or higher; RESERVE Section - Rated Under 1800 but above 999, OR unrated. KNIGHT Section: Under 1200 or unrated. PREMIER AND RESERVE are USCF-rated, 5SS, G110d5, Rounds: SAT 9 AM - 2 PM - 7 PM, SUN 9 AM - 2 PM. KNIGHTS section is CXR-rated, 6 Rds, G35d5 , all rounds on Saturday, round 1 starts at 9 AM. 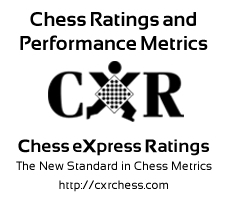 $$ ENTRY FEE: $55.00 for USCF Sections; $35 for Knights Section, CXR rating fee is included. $$ PRIZES: PREMIERE: 1ST $525, AR Champion Title; 2nd $300; Best Class A $200. RESERVE: 1st $300, AR Reserve Champ Title; Class Prizes: B,C,D/U $150 each; KNIGHT: 1st: $100, Trophy, 2nd $60, trophy, Class Prizes: E,F,G/U $30 each. Directions Pull into parking lot for the ANSWER building.